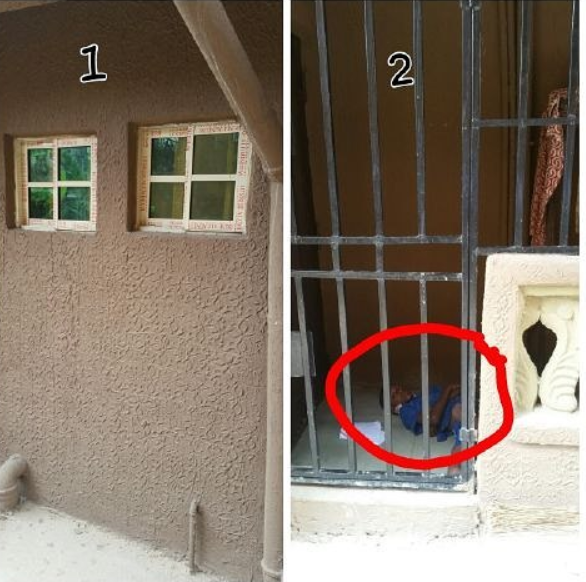 I want you guys to analyse these two pictures very well, it's been bothering me but I don't know what to do..THIS is where I live in Onitsha,and this pic is my neighbour's flat,we share the ground floor..The mother of the house is a teacher who teaches in Ebonyi state,nd leaves Onitsha everyday to Ebonyi..She has 5 kids,12,6,3,2 and 1 year respectively. .she travels with the one year old everyday and locks the rest at home..she goes out with the key..so the 12 year old is the one I circled in the pic,I came home for lunch now and I saw the boy crying there,his mom locked him in that place and locked the younger ones in the house,ofc she took the keys ..Prior to this time,she used to lock them all in the house,but the 12 year old will scale thru the toilet window which is the no 1 picture,go out and leave his younger ones in the house from morning till night.Yesterday,his mom came bk around 4pm,earlier than expected and he didn't come bk till 7pm..that's what prompted her to leave him in the mini cell with no food or water.. Firstly , I think locking kids in the house is a bad idea. Secondly, I don't know what to think,how to advise her and all coz she needs help.. A 12 year old boy scaling ?his younger ones are watching ,what do u think will happen?